This site is a favorite among many #AdlandAffiliates myself and Diane included. I personally have not ventured into Instagram but have been considering it, which may have been a mistake or a blessing for me. Now I have access to all this great info on how to use Instagram to blend with your Brand Recognition. Build your personal Brand and all else will be much easier for you. Are you looking for ways to use Instagram Stories? Want to know what’s working for other businesses? The videos, pictures, and text in Instagram stories help pique your followers’ interest on an authentic and personal level. 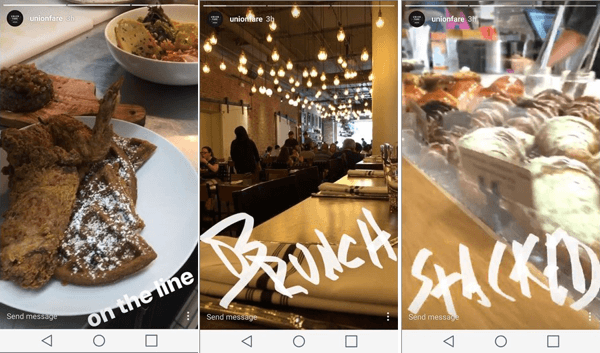 In this article, you’ll discover how five businesses are using Instagram Stories and how you can create similar content. You can use both still photographs and videos to create Instagram stories. Your videos don’t have to be anything spectacular. In fact, videos can be a great way to show your audience a unique view of the day-to-day happenings at your business. New York City restaurant Union Fare uses Instagram Stories to share video from their restaurant’s operations using informal captions. The videos give viewers an inside look at the restaurant and some of the delicious food on their menu. If a hungry viewer happens upon these videos at lunchtime, you better believe they’ll think about heading there for some grub. Union Fare shares an informal look at daily business. Capturing video in Instagram Stories is simple. After you navigate to the main Instagram Stories screen, hold down on the middle button at the bottom of the screen to take a video (tap to take a picture). Yes Instagram is needed ( so they say) for branding and business...but is it? I will say that if you have a lot of people on your list/your followers/customers on Instagram and if you have the time to really pay attention to it, then by all mean use it. If you do decide to use it..maybe keep us informed? I'm not a cat person but since we are or at least I am, pondering, upon this. Thanks for the congrats and share. I am thinking that using Instagram from a brick n mortar standpoint would be a cool way to offer up advertising to those local businesses. If one were to learn Instagram well enough to help those B&M businesses to grab local customers. Just another tool in one's quiver so to speak. Perhaps offer to come out on a schedule of some kind and record live events at the venue or some odd thought like that. Anyways, still deciding on whether to create an account or not and what profile to use too. Do you brand a business, you, both, can you do that with Instagram or not?